When application temperatures exceed the limits of exfoliated graphite, the end user has a recourse to a number of specialist jointing materials which maintain their integrity at temperatures up to 1000°C. 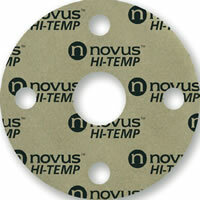 Novus Hi-Temp is a specially developed sealing material capable of maintaining a long term seal at temperatures to 1000°C. It is available in sheet form reinforced with a stainless steel tanged insert or as a filler for spiral wound gaskets or Camprofiles. In addition to the materials resistance to high temperatures, it possesses outstanding chemical resistance making it suitable for applications where many conventional sealing materials are attacked. A specially developed sealing material with applications in high temperature environments such as exhaust manifolds, gas turbines, gas and oil burners, heat exchangers.